Almost two weeks ago the Document Foundation released LibreOffice 5.3.3. 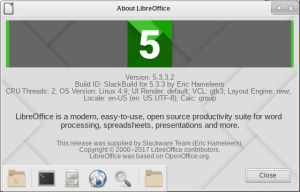 I silently uploaded Slackware-current packages for libreoffice-5.3.3 last week already and then concerned myself with some work on Plasma 5. And now, I have finally compiled a new LibreOffice for Slackware 14.2 as well, replacing the version 5.2.5 packages that I had in my repository. Read about the new features in LO 5.3 if you want: http://www.libreoffice.org/discover/new-features/. Posted: 23 May, 2017 in Slackware, Software. ldd for /usr/lib64/libreoffice/program/soffice.bin looks fine, no missing libs. I’ve installed you upgrade together with Wed May 24 04:51:46 UTC 2017. Maybe some new stuff is misbehaving there? Deny Dias, I have no idea what I should be looking at… I see a very dark themed LO preferences window in a language I do not understand. So for me there’s nothing that I can comment on. Don’t worry, Eric. I’ll trace this down to a fix. @gerard: this is the default theme, only with dark colors set by Breeze Dark via GTK integration. Found it! I was using Breeze-dark as GNOME App Style in KDE preferences. It happens that Breeze-dark is broken. I changed that to Adwaita-dark and all looks good again. Upgraded here on Slackware64 14.2 with KDE. Everything works fine. Thanks for this! And the build directory for VLC…heard about the subtitle hack, so I used your slackbuild to compile 2.2.6. Since internals changed between 2.2.4 and 2.2.5.1, should I get the new build directory and redo it? Jen, at the moment I am uploading vlc-2.2.6 packages so you can take the current state of the ‘build’ directory if you want – several updated libraries in there. After the latest -current update which updated glew to 2.0 LibreOffice fails to run, complaining that libGLEW.so.1.13 could not be found. 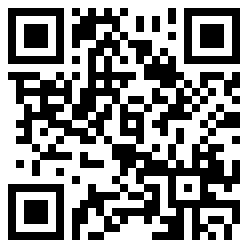 However, symlinking to the latest libGLEW installed serves as a workaround. I write this here in case the workaround is useful to someone. FredM you need glasses or quit the dope. Read TWO posts above yours please. Many Thanks for great needed package. It seems that Slackware current has updated it’s packages and libraries that was required by LibreOffice. Would you mind create the newer version? Excuse me, I did not understand. What post did you mean Bob? Mohammad, I should not have used the word “post” and should have said “the comment dated June 14, 2017 at 05:14” instead. You just need to read the comments right above yours and you will find the answer. 3) lowrite (Writer) crashes after any (re)start now. menu Tools – Options… – Advanced – Enable a Java runtime environment checkbox. Does anybody have crashes there (32-bit only)? Does anybode have any suggestions to resolve the problem? Slackware 14.2 64-bit has no the problem. bormant, did you install the latest kernel and glibc for Slackware 14.2? I have seen several issues reported where Java programs cause crashes when you are using kernel and glibc that have been patched against the Stack Clash bug of last month. I have no idea why this manifests itself only on 32bit. I have not seen these crashes myself, in fact I do have OpenJRE enabled in my LibreOffice but I am using a 64bit Slackware OS. The crash has gone. Thanks. Another may be workaround for those who want to use patched Stack Clash bug Slackware kernel is switch to repackaged libreoffice 5.3.4 binaries from TDF/SBo, as I can see it doesn’t crash here with updated kernel and jre/openjre/jdk/openjdk. This is on your own. >I have no idea why this manifests itself only on 32bit. does the trick here, LO doesn’t crash with kernel 4.4.75. The maximum stack_guard_gap that prevents crash is 6 here. It is more then old default 1 page, but much less then new default 256 pages so much more vulnerable (stack clash). Use this on you own. for me Libreoffice 32 bits stopped working on version 5.3.3. I updated to 5.4.6 but I get the same problem of it exiting abruptly on just after the load screen. I have the updated kernel, glibc and openjre on Slackware 14.2, but it still crashes. I’ve tried disabling hardware acceleration and font aliasing, but no change. Anyway, just documenting it here in case someone else has the same problem.